There was an interesting chart in the New York Times article Shrinking Lines of Credit. The fact that home lines of credit are shrinking is not really news, nor is the fact that mortgage rates are stubbornly high. I have talked about both of those on many occasions. However, I do like this chart from the article (annotated by me with blue arrows) that shows the widening gap between treasuries and mortgages. In remarks broadcast by satellite to a monetary conference in China late Monday, Greenspan ruminated on what he previously described as a “conundrum” — long-term interest rates that have remained low and even fallen despite the Fed’s yearlong campaign to raise short-term rates. But in classic fashion for the sometimes enigmatic chairman, Greenspan’s comments were ambiguous enough to support both sides of a debate raging in financial markets over whether the low long-term rates signal trouble ahead for the U.S. economy. 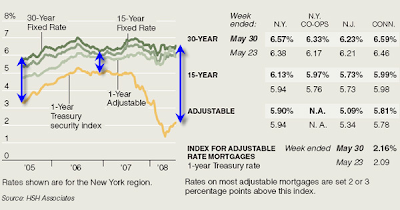 Now we see that short term rates have fallen like a rock, but mortgage rates have not done likewise. 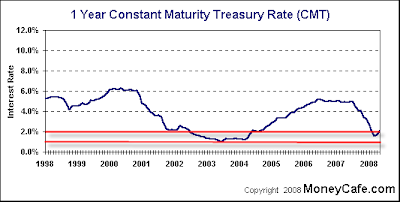 I called for this mortgage to treasury disconnect to happen years ago, based on the idea of increasing default risk. Clearly that has happened in spades. Of course there really was no conundrum then, nor is there one now. It was all in Greenspan's head. Conundrum or not, new home buyers are not seeing a penny of these rate cuts in spite of many misleading ads that I see about "low mortgage rates". The only people benefiting from the recent Fed rate cuts are those in existing mortgages, assuming their margin to the treasury or LIBOR index was reasonable. The above charts show the extent of the problem, or rather non-problem, for anyone in a 3-year ARM about to reset. ARMs are typically tied to 1-Year LIBOR or 1-Year Treasury. 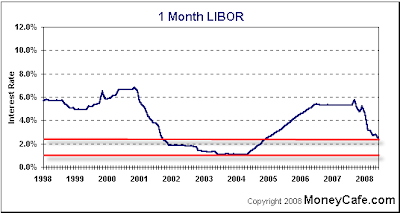 Interest only loans are often tied to 1-Month LIBOR as ours is. Our margin is 1.25 (which will put our month to month adjusted rate at 3.75%). 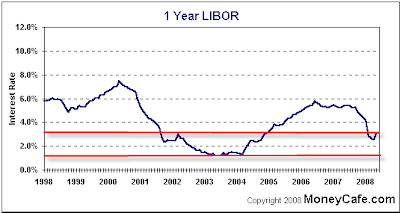 Admittedly things did not look so hot last August when LIBOR spiked in a a credit crunch. By the way, we make extra payments every month as if the loan was a 15-year fixed. Interest Rate Reset Sticker Shock? Only those in 5-year ARMs are likely to see big sticker shock when rates reset, and even then the problem is more so for those in ARMs tied to 1-Year LIBOR as opposed to 1-Year Treasury. Of course, at reset, the interest only period is over which means there will be an additional increase in monthly payments because of mandatory principle payments with 5 year ARMs effectively amortizing over 25 years and 3 year ARMs over 27 years. From this point forward, many in 3-Year ARMs are likely to see a reduction in rates when their loan resets. Much of this depends on whether or not they got involved in a big "teaser rate" reduction on the initial loan, as well as the agreed upon spread (margin) to the index. Many loans are resetting now so I would like to repeat a word of caution: Lenders may attempt to take advantage of these resets to get you to do something that is not in your best interest - refinance into a bad deal based on scare tactics. If you are in an adjustable rate mortgage about to reset, regardless of who it is with, please read Dear Citigroup Customer .... before taking action.